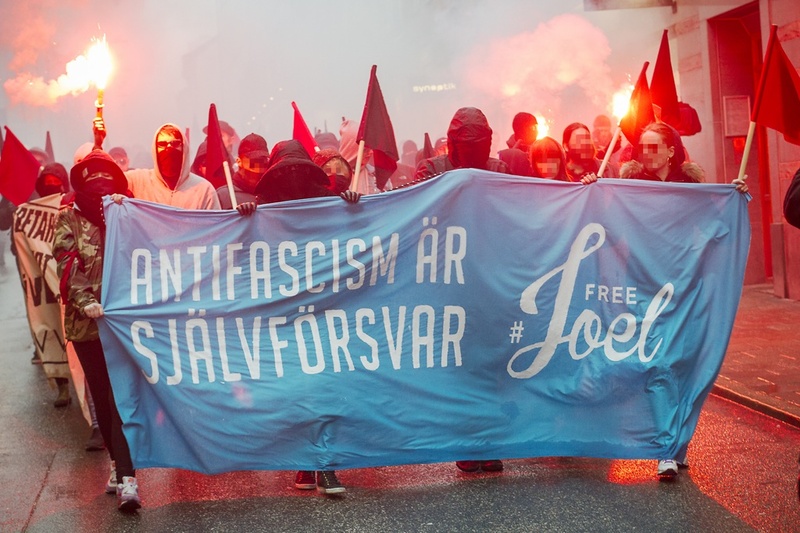 Joel was one of the antifascists who chose to defend the anti-racist demonstration in Kärrtorp when it was attacked by fascists. He acted in self-defense but was sentenced to a 5,5 year long imprisonment in Svea Court for attempted manslaughter. Today Joel is active within Fånggruppen and tries to make the best of the situation by building a network with other political prisoners and spread knowledge about prison struggle and solidarity work even to us who still have our freedom intact. The work he performs is important, but he will never get back the years inside the walls. It’s years without close contact with family and friends, years without freedom, and natural connection. For most of us it’s impossible to imagine that kind of situation, but we are many who stand united with his actions and we continue to claim that antifascism is self-defense. The least we can do, those who are on the other side of the walls, is to come together to pay the bills he has to pay in addition to his imprisonment. These 40 000 kr (approx.. 4268 euro or 4697 USD) is a cost that Joel shouldn’t have to pay personally, but instead we take it as a collective, all of us who stand with Joel and the other antifascists who defended the popular demonstration on the square in Kärrtorp. To contribute to this fundraising is a concrete way to show solidarity, but it’s also a symbolic act which shows that we are many who stands up against fascism together. The price of antifascist activism should never fall on individuals, instead we pay for it as a collective movement. AFA Stockholm: Joel sitter av tiden – Vi betalar hans böter!